i just noticed that i haven’t written in a few days…and that bothers me. i feel this blog is a part of my life and when i don’t post anything then i feel weird. ha. i don’t know if anyone else can relate but yea. this week has been a busy one with some type of outing(s) each day. and i can’t believe it’s only thursday! lol. but that does mean this starts tomorrow!!! ummm…yes please!! this comes just in time for these hot temp days coming up. i’m excited….not excited about driving the 25 minutes to the nearest SB but still. it’s worth it. sadly, it’s a good thing that there’s not one closer…otherwise all my money would be going there. friday also means family coming into town! always excited about that!! well i have lots of projects that are half way done, barely started, and/or still in my head….now i just need to find the time to finish them!! i am also in the process of learning how to redesign my blog. it’s an experiment pretty much. learning all the behind the scene things and then tinkering with the appearance….so with that being said i apologize if my site looks crazy every now and then. ;) have a great thursday! 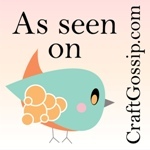 ps…just found out that i was featured on craft gossip for my little bathroom organizer project. how fun!